Classy Gear â€“ Gear We Like: September 2010 | It's not your tech, it's how you use it. This month’s Classy Gear is more of a hodgepodge of goodies you can pick up for yourself on any budget – and in keeping with theme from our last post, 5 Easy Tips for a Better Workspace, there are a few goodies in here to help you keep your workspace nice and tidy and organized while you’re at it. So since most of us are back to school or back to work or in any event sitting (or standing) in front of a workspace for a good chunk of the day these days, let’s take a look at some gadgets and gear that will help you keep your space nice, tidy, organized, and effective, shall we? Okay, it won’t really help your productivity, but this fantastic item came out of the labs at ThinkGeek last week and has taken the world by storm, and for good reason. 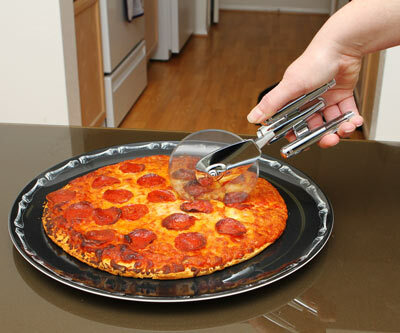 After all, the Star Trek Enterprise Pizza Cutter is one of those things you look at and wonder “why hasn’t anyone thought of this before? !” and then of course you head over, add it to your cart, and buy one for yourself. And then maybe a few more to give to fellow Star Trek fans around the holidays. And believe me, you’ll need them – I can only imagine that with the sheer amount of coverage the Enterprise Pizza Cutter has been getting that they won’t go pretty quickly. That said, head over and get yours today. Seriously, I know it’s not traditionally what you would Ray Ban outlet online consider “classy,” it’s not ergonomic and it’s not super stylish, but sometimes you just have to give in to your geeky side. Trust me, I understand. Don’t fight it, do it right – and this my friends, this is right. One of the things I noted in the previous column was that you should try to remember to at least think about ergonomics when you’re laying all of your stuff out for a new workspace, or even if you’re just giving your existing workspace a little sprucing up. What makes you comfortable now will save you injury and aches and pains for years to come, so exercise your brain power a little bit to be a bit more comfortable and active when you get a bit older, okay? Part of that is making sure that your displays are at eye-level as much as possible, and you’re not turning and tilting your head a ton to move from the display on the left to the display on the right, or wherever you have them oriented. If you have a laptop and an external display, it can help a lot to keep the laptop display at the same level as the stand-alone monitor (preferably both are at eye-level,) but to do that, you’ll need something to stand your laptop on, won’t you? Enter the mStand Laptop Stand By Rain Design . Designed for the Macbook and Macbook Pro, the mStand can work just as well with any other laptop with a good flat underside, and it tilts the bottom so if you have to you can still use the keyboard while tilting the display back far enough that it’s easy to see while you’re sitting in front of it using an external keyboard and mouse. Each mStand is carved from a single piece of aluminum (which helps dissipate heat) and has a stop at the bottom so your laptop doesn’t slide out of place. The rubberized stoppers around the body of the mStand also keep your laptop secure in one location, even if you’re swapping cabled and peripherals on either side. You can read more about the design here at Rain Design’s mStand page. There reall is nothing more frustrating than having a bunch of cables connected to your computer, knowing that if one of them slips or gets unplugged that you’ll be fishing around behind your desk for ages trying to find it, and then you have to deal with the arduous task of feeding the cable up to the top of your desk without it falling back down on you. That last bit is the part I hate the most. 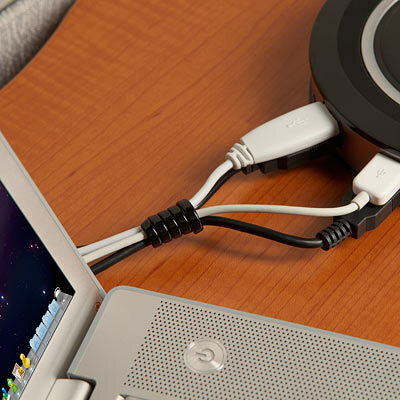 That’s why I’m a huge fan of desk accessories like the Twistits Cable Organizer from ThinkGeek. Just bundle up a bunch of your cords and cables into the Twistits and leave yourself some slack at the other end for your connectors, and you’re all set. Sure, you could accomplish the same thing with twist-ties, but they’ll fray and look awful. You could get velcro strips, but you’ll eventually misplace them and they’ll come apart. The Ray Ban outlet awesome thing about the Twistits is that they’re small enough to not be horribly notable on a bundle of cable, they come in black or white so they blend in with your cable instead of stick out, and they’re inexpensive, at $8.99 for a 20-pack! Nothing’s more disruptive when you’re zoned and getting some quality work done than a chatterbox coworker who insists on having a conversation right next to your desk, or outside noise when you’re working serenely at your desk in your home office. Maybe you just like music while you work, and you really want to hear everything without having to hear the ambient sounds of the air conditioners turning on and off at your office. Well, if you want quality noise cancellation but you don’t want to sacrifice audio quality, you won’t go wrong with the Creative Aurvana X-Fi Noise-Canceling Headphones . 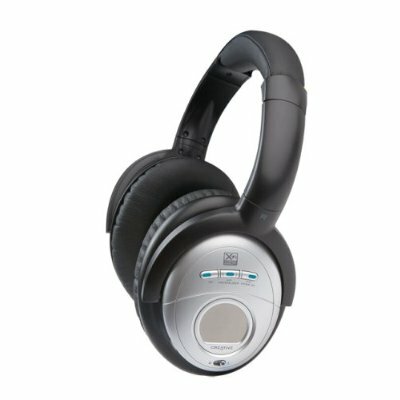 The X-Fi may not be quite as elegant as the noise cancelling champion, the BoseÂ® QuietComfort 15 Noise Cancelling Headphones , but they’re over $100 dollars cheaper than the champs, and according to PC Mag they get the job done better at a lower price point. Regardless of which of these guys you buy, you’ll be happy, and you’ll never have to hear the coworker who insists on having all of his meetings behind your chair or loudly at his desk ever again. Even if you don’t want to listen to music, just toggle the active noise cancellation and you’ll find a little peace and quiet. If you’d rather rock out, just plug them into your music player or headphone jack and it’ll be you, the work you’re trying to get done (or the gaming you’re trying to do) and your music. One thing I’ve learned to be a little greedy about when it comes to my workspace is the amount of storage I give myself for files, downloads, music, and movies. I have a ton, and they’re only the tip of the iceberg. I’m starting to get pretty obsessive about backups as well, which means I need to have copies of my data in case something Occhiali Da sole Ray Ban outlet happens to my computer or the data I have on it. And then I need backups of the backups in case something happens to the backups. And then I need offsite backups of the backups in case something happens to my apartment. You see where this is going. In there somewhere I’ve learned to love the external hard drive for what it is – a quick and sensible solution for backing up your data and keeping a few big files available at all times. Still, don’t just stick with a plain old USB hard drive, go big and get serious with the LaCie Network Space 1TB NAS Drive . What’s that? 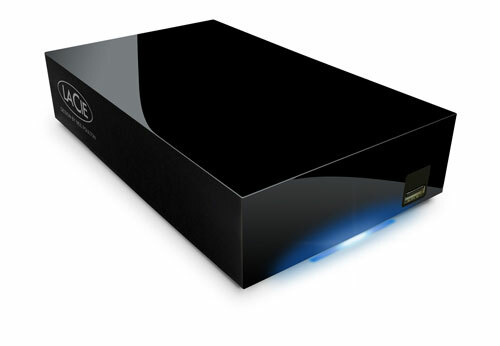 One terabyte just isn’t enough for your massive music collection? Okay then, spring for the 2 terabyte model, the LaCie Network Space 2TB NAS Drive . The important thing that makes these guys impressive is the fact that they’re LaCie, which is pretty well known for its quality in desktop hard drives (and don’t get me wrong, these drives aren’t horribly cheap, but you get what you pay for) and they’re all Network Attached Storage (NAS) devices, which means you can plug them into your home network and access them like a shared drive from multiple computers. That also means that you can install your favorite backup software on all of the computers in your home, make folders on the LaCie Network Space drives, and back up directly and automatically to the drive without plugging in another cable to your computer. The Network Space drives have a USB port on them so you can attach yet another external hard drive if you like, or any other USB device that you’d like to add to the available storage or back up to the Network Space with a single touch. These guys even act as iTunes servers, so if you put your iTunes library there you can stream music and movies on it to other devices. Connect it to your network and your XBox 360 or PlayStation 3 will see it as a media device and let you play your media. Yup, instant and automatic backups without you having to think about them, and multimedia features for your home network? You can thank me later. That does it for this month’s Classy Gear. Hopefully I’ve given you some ideas and options for keeping your workspace tidy and ensuring it helps you work, instead of you working to get around it. Also, take a little time and make sure that your workspace has the tools and utilities on it to keep you working productively, whether it’s something as simple as some noise cancelling headphones to help you block out ambient or annoying noise, or a little extra disk space to keep your important files backed up or to save you from deleting something every time you want to save a new project. As always, leave a comment and let me know what you think about the gear this month! If you have any suggestions for items to be features in a Classy Gear segment, say the word!